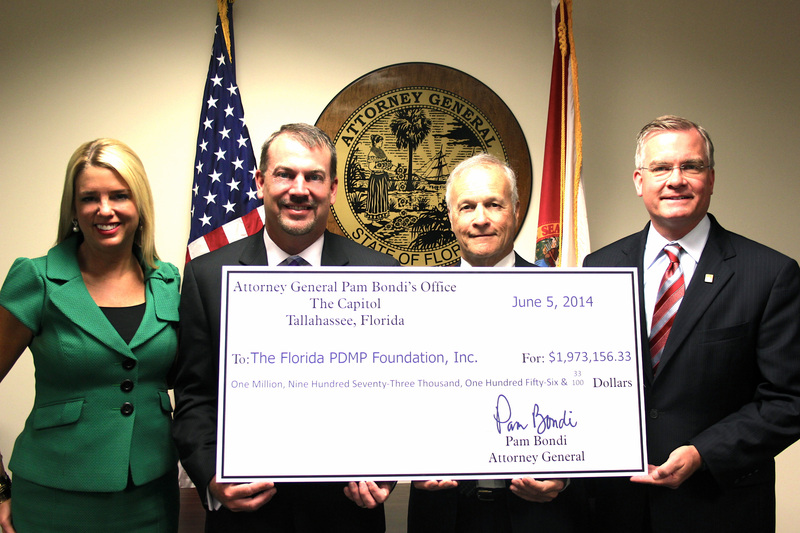 June 5, 2014 - State Surgeon General and Secretary of Health Dr. John Armstrong joins Bob Macdonald, Executive Director of the Florida PDMP Foundation, Inc., and Dave Bowen, Chairman of the Board of Directors of the Florida PDMP Foundation, in accepting a check in the amount of $1.9 million from Attorney General Pam Bondi. The money was part of a settlement from Caremark and will be used to fund E-FORCSE operations for the next four years. For more information, please see Attorney General Pam Bondi's Press Release. Since implementation of the PDMP in 2009, there have been four sources of funding for the administration of the program, as outlined below. The Department remains committed to exploring innovative options for identifying projects and securing funds for the PDMP, and stands ready to work alongside our stakeholders and partners to ensure the future of the program. General Revenue – The Florida Legislature authorized general revenue appropriations of $500,000 for administration of the PDMP for FY2013-14, FY2015-16, FY2016-17 and FY2017-18. The Florida Legislature has authorized $873,089 in recurring and $117,000 in non-recurring funds for FY2018-19. Private Fundraising – The Florida PDMP Foundation (Foundation), Inc., is a 501(c)(3), not-for-profit organization incorporated with the Florida Department of State. The Foundation operates as a direct support organization for the Department to provide funding and support for the PDMP. Since its formation, the Foundation has raised over $2.2 million and has provided $1,010,513 to fund the administration of the PDMP. Federal Grants - The PDMP has been awarded seven federal grants totaling $3,192,741, which are based on specific projects outlined in the grant application and only a limited portion (if any) may be used to offset infrastructure, personnel, and facility expenses. The PDMP has applied for and was awarded sixHarold Rogers PDMP grants from the Department of Justice, Office of Justice Programs, Bureau of Justice Assistance and one grant from the Substance Abuse and Mental Health Services Administration. Private Grants - The PDMP was awarded three grant awards from the National Association of State Controlled Substance Authorities totaling $49,952. These private grant funds were used to create a website, to purchase office equipment, and to purchase promotional items.